In India, we have a parliamentary system of government which is based on the British model of government. In such a system, the real executive authority is the Council of Ministers which is headed by the Prime Minister of the country. Our constitution does not describe in detail the principles of our parliamentary system except in Article 74 and Article 75 of our Indian Constitution. The constitutional provisions related to aid and advise the President are mentioned in Article 74 while some other provisions are mentioned in Article 75. 1. Article 74 provides for the Council of Ministers which is headed by the Prime Minister, to aid and advise the President. The President will perform his functions and duties according to the advice provided by this Council. The President can also ask the Council of Ministers to reconsider their advice but he has to act on the reconsidered advice. 2. Any advice or recommendations given by the Council of Ministers is outside any judicial review. 1. The Prime Minister is appointed by the President and other members of the Council of Ministers are appointed on the recommendation of the Prime Minister, by the President. 2. According to the 91st Amendment Act of 2003, the total strength of the Council of Ministers must not exceed 15% of the total strength of Lok Sabha. 3. According to the 91st amendment of 2003, a member of either the Lok Sabha or Rajya Sabha, who has been disqualified on the basis of defection, is automatically disqualified as a Minister. 4. All the ministers of the Council of Ministers hold their office according to the will of the President. 5. The Council of Ministers is responsible to the Lok Sabha as a single unit. 6. The oaths of the members of the Council of Ministers are administered by the President. 7. A person who has been appointed as a minister, can hold such a position for 6 months if he is not a member of either Lok Sabha or Rajya Sabha. The Council of Ministers has three different sub categories, Cabinet Ministers, Ministers of State and Deputy Ministers. The difference between these three bodies of ministers is their political importance and their ranks. At the top of these three bodies lies the Prime Minister who is the supreme governing unit of the country. This is a very small body consisting of about 15 to 20 members. These ministers hold very important ministries of the central government like the Home Ministry, Defense Ministry, and Finance ministry. These ministers attend the cabinet meetings with the Prime Minister and play a very crucial role in all the political and strategic policies of the country. The ministers of state may be given independent Ministries or departments or they can be assigned to work alongside the cabinet ministers. When the ministers of state are assigned to work alongside cabinet ministers or if they are given some specific department under their ministries, or if they are given their own Ministries, in every case, these ministers act and function under total authority and supervision of the cabinet ministers. In other words, the ministers of state are under full authority of the cabinet ministers and their rank is inferior to them. Even when the ministers of state are given the charge of individual ministries, they are still not allowed to attend the cabinet meetings. However, they may be invited to discuss a matter of their concerned Ministry. The deputy ministers are not given charge of individual ministries. They are assigned to assist the cabinet ministers and ministers of state. As they are also not the members of the cabinet, hence they do not attend any cabinet meetings. Apart from the above three categories of ministers, there’s also a 4th category of ministers which is known as the Parliamentary Secretaries. The parliamentary secretaries don’t have any department under their control. Their basic function is to assess the senior ministers and help them to perform their respective parliamentary duties. However since 1967, no parliamentary secretaries have been appointed. Then there is the case of Deputy Prime Ministers. Deputy Prime Ministers are appointed only for political reasons for example L.K. Advani served as the deputy Prime Minister to the then Prime Minister Atal Bihari Vajpayee. As we have discussed, Prime Minister is appointed by the President and the other ministers are appointed on his advice, also by the President. Usually, members of either Lok Sabha or Rajya Sabha are appointed as Ministers, but a person who is not a member of either of these houses can also be appointed as a minister, given that he becomes a member of either of these houses, either by Election or by Nomination, within 6 months of joining his office. 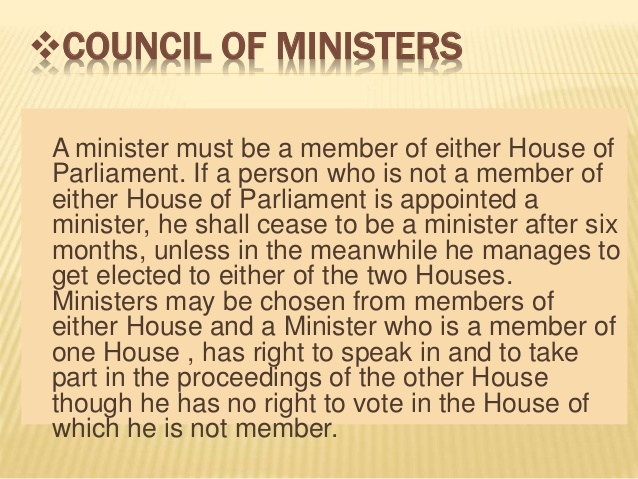 Note: A minister has the right to speak and take part in the proceedings of both the houses of the Parliament but he can only exercise his right to vote in the house of which he is a member. According to the 42nd and 44th Constitutional Amendment acts, the advice which is given by the Council of Ministers to the President is binding on the President. This means that the President must act on the advice which has been given to him by the Council of Ministers. Moreover any such advice which has been given by the Council of Ministers is outside the scope of the Judiciary system. That is, it cannot be challenged in a court of law. The cabinet is the highest decision making authority of the nation’s union government. It makes and manages all the foreign policies and Foreign Affairs. It makes sure that that the decisions made by the cabinet are implemented by the Council of Ministers. The word Cabinet was introduced in our constitution by the 44th Constitutional Amendment Act of 1978, under Article 352 of Indian Constitution. According to Article 352 of Indian Constitution, Cabinet is defined as the Council headed by the Prime Minister and consisting of other ministers of cabinet as appointed under Article 75. Its roles and responsibilities are not mentioned in our constitution and are totally based on the conventional system which was developed in Britain. Very often people confuse Cabinet with Council of Ministers. These two bodies are not the same. The Council of Ministers consist about 60 or 70 ministers whereas the cabinet only consists of 15 to 20 members. 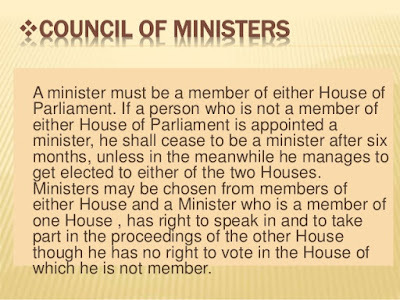 There are three subcategories in the Council of Ministers where as there are no subcategories in a cabinet. Also, decisions taken by the cabinet are binding on all members of the Council of Ministers.